Parlez-vous Français? Learning at school was never like this. L'Ecole des Trois Ponts in Roanne offers students the chance to perfect their language skills in style. The quickest and most effective way to leam French is to go to France and speak nothing else. The most pleasant way to do this would be to stay at a château in beautiful surroundings with people who know how to help you. 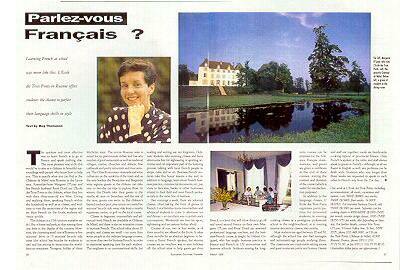 This is exactly what you can find at the Château de Mâtel near Roanne in the Lyons area. Living and studying there, speaking French within the household as well as at classes, and with time to visit the attractions of the region and try their French on the locals, students advance quickly. The château is a 17th-century mansion set in 13ha of forest and park, so that staying there one feels in the depths of the country. However, the charming small city of Roanne is five minutes' drive or 15 minutes' bicycle ride away (the school has bicycles for students to use) and has among its attractions the world-famous restaurant Troisgros, holder of three Michelin stars. The entire Roanne area is noted for its gastronomie riches and has any number of good restaurants as well as medieval villages, castles, churches and abbeys, fine craftwork and pretty mountain and river scenery. The Côtes Roannaises vineyards and wine cellars are on the outskirts of the town and, as the area borders the Beaujolais and Burgundy wine regions, guests at the château can take one or two day car trips to explore these. In winter, the Dorels take their guests to the nearby ski area on Saturdays, and the rest of the year, guests can swim in the château's heated outdoor pool, play tennis on courts five minutes' bicycle ride away, ride from a nearby equestrian centre, or golf on the local course. Classes in beginner, intermediate and advanced level French are available at Château de Mâtel, and there is also an intensive course in business French. The school takes about 20 people, and classes are small - no more than six people in the ordirary language courses, no more than two for business French, in order to maximise speaking time for each student. The emphasis is on conversational skills, but reading and writing are not forgotten. Ordinary students take morming classes and have afternoons free for sightseing or sporting activities and, an important part of the leaming process, talking with local French people in shops, cafes and so on. Business-French students take five hours' lessons a day and, in addition to language, learn about French business practice, commercial documents, etc, pay visits to factories, banks or other businesses related to their field and meet French professionals in the same line of business. Two evenings a week, there are informal classes, often taking the form of games in French. Local families invite intermediate and advanced students to come to aftemoon tea and dinner - an excellent way to polish ones conversation. Weekends are free for sport, sightseeing and excursions farther afield. Courses of one, two or four weeks, or of three months, are offered at the Ecole. It takes three months for an absolute beginner to become a fluent French speaker, but shorter courses are an excellent way to start holidays off - the school aims to help guests get their French to a level that will allow them to go off and travel around France on their own. Margaret O'Loan and René Dorel are seasoned professional language teachers, and the business-French course is taught by Gabriel Coquard, who has taught business practice in France and French at US universities and business schools. Students staying for longterm courses can be prepared for the Alliance Français examinations, and guests are given a certificate at the end of their courses, stating the content and duration of the course (which is useful for tax-declaration purposes). In addition to the language classes, L'Ecole des Trois Ponts organises participation, for interested students, in evening cooking classes at a prestigious professional school in the neighbourhood, or in evening interior décoration classes, also nearby. Most students are aged between 20 and 50, although the school has also had teenagers and retirement-age people studying there. The classrooms are comfortable sitting rooms and guest rooms are pretty and homey. Guests and staff eat together; meals are family-style cooking typical of provincial France. 0nly French is spoken at the table, and staff always speak to guests in French - although, as all fluent in English as well, any problems can dealt with. Students who stay longer th three weeks are requested to speak to each other in French only from the 21 st day.